The US is getting ready for the big discounts on Black Friday and Best Buy is kicking off things early with a Surface RT 32GB deal for just $200. Black Friday isn’t for a couple of more weeks so you’ll have to wait until then, the deal is only valid between November 28 and 30. The good news is that this is an online deal, so you won’t have to brave the Black Friday queues. Plus you get free shipping. Note that the price doesn’t include a keyboard. 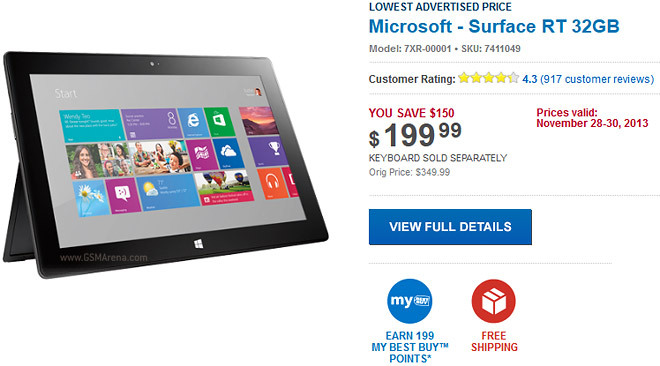 Still, the Surface RT 32GB is $330 at the moment on Amazon.com, also without a keyboard. Microsoft dropped the price of its first-generation Windows RT tablet to $350 back in July, following a special price cut for educational institutions to $200 in June. According to Microsoft numbers, Surface sales have doubled recently, though it’s not clear how much profit the tech giant is actually making with all these price cuts. Anyway, the UK price of the Surface RT 32GB also seems to have gone down – the Microsoft web site lists it at £280 but it’s out of stock. Tesco has it for £270 and that includes a keyboard. Amazon UK currently has it on £330 sans keyboard. If you find other deals for the Surface RT, drop a link in the comment section.